Human causes include burning fossil fuels, cutting down forests, and developing land for farms, cities, and roads. These activities all release greenhouse gases into the atmosphere. Natural causes include changes in the Earth’s orbit, the sun’s intensity, the circulation of the ocean and the atmosphere, and volcanic activity. Although the Earth’s climate has changed many times throughout its history, the rapid warming seen today cannot be explained by natural processes alone. Human activities are increasing the amount of greenhouse gases in the atmosphere. Some amount of greenhouse gases is necessary for life to exist on Earth—they trap heat in the atmosphere, keeping the planet warm and in a state of equilibrium. But this natural greenhouse effect is being strengthened as human activities (such as the combustion of fossil fuels) add more of these gases to the atmosphere, resulting in a shift in the Earth’s equilibrium.” For reference and additional information see this additional fact sheet from epa.gov/climatechange. “At the current rate, the Earth’s global average temperature is projected to rise from 3 to 7°F by 2100, and it will get even warmer after that. As the climate continues to warm, more changes are expected to occur, and many effects will become more pronounced over time. For example, heat waves are expected to become more common, severe, and longer lasting. Some storms are likely to become stronger and more frequent, increasing the chances of flooding and damage in coastal communities. Climate change will affect different regions, ecosystems, and sectors of the economy in many ways, depending not only on the sensitivity of those systems to climate change, but also on their ability to adapt to risks and changing conditions. Throughout history, societies and ecosystems alike have shown remarkable capacity to respond to risks and adapt to different climates and environmental changes. Today, effects of climate change have already been observed, and the rate of warming has increased in recent decades. For this reason, human-caused climate change represents a serious challenge—one that could require new approaches and ways of thinking to ensure the continued health, welfare, and productivity of society and the natural environment.” For reference and additional information, see this additional fact sheet from epa.gov/climatechange. Learn more about climate change in Colorado with resources developed by the University Colorado Boulder’s Office of Outreach. Climate justice and issues of equality related to a warming planet are also of significant concern. People from the Global South, low-lying island nations, of indigenous descent, the global poor, and a wide host of species, are often the first to suffer from climate change – while producing little to no carbon emissions compared with those of industrialized nations. As the climate changes, these communities and species will be on the front lines of economic and environmental upheaval. 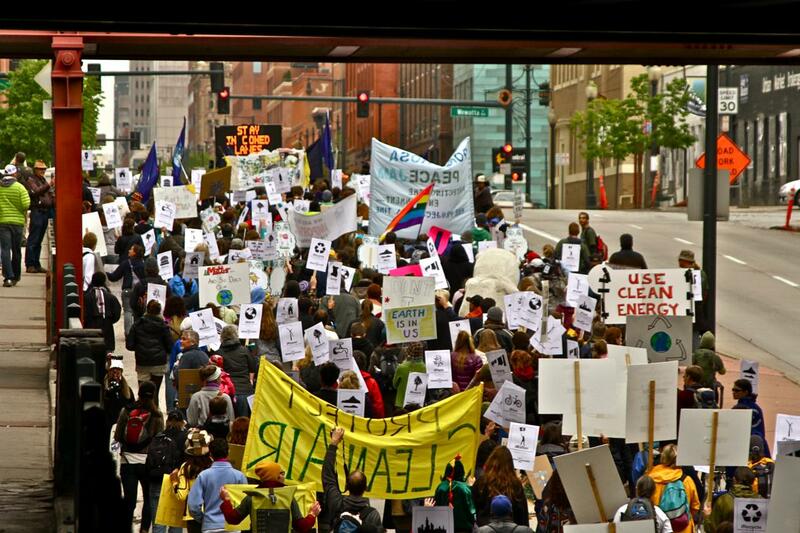 To learn more about climate justice, visit the Global Justice Ecology Project. According to 350.org, “For all of human history until about 200 years ago, our atmosphere contained 275 parts per million of carbon dioxide. Parts per million is simply a way of measuring the concentration of different gases, and means the ratio of the number of carbon dioxide molecules to all of the molecules in the atmosphere. 275 ppm CO2 is a useful amount—without some CO2 and other greenhouse gases that trap heat in our atmosphere, our planet would be too cold for humans to inhabit. Beginning in the 18th century, humans began to burn coal and gas and oil to produce energy and goods. The amount of carbon in the atmosphere began to rise, at first slowly and now more quickly. Many of the activities we do every day like turning the lights on, cooking food, or heating or cooling our homes rely on energy sources like coal and oil that emit carbon dioxide and other heat-trapping gases into the atmosphere. We’re taking millions of years’ worth of carbon, stored beneath the earth as fossil fuels, and releasing it into the atmosphere. By now—and this is the second number—the planet has about 388 parts per million CO2 – and this number is rising by about 2 parts per million every year.” For more information visit 350.org.